This week I reinvented a classic Real Simple magazine recipe for Chicken and Cashews in Lettuces Wraps and made it with a Vietnamese twist. The key to this recipe is the Nuoc Cham sauce which is made from fish sauce. I had searched high and low for a great nuoc cham recipe, one that isn’t too fishy and holds up to restaurant standards. I really like this one from the Sunday Nite Dinner blog. I used all but one of the suggested ingredients, as I substituted a small amount of jalapeno pepper for the thai pepper. 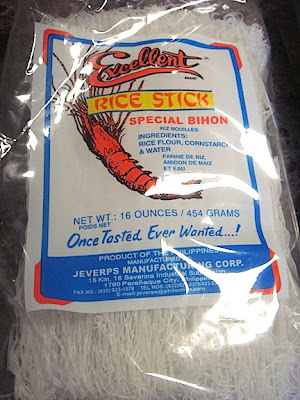 I also sprung for the high-quality Three Crabs brand of fish sauce, and dissolved the sugar in water on the stove. It really came out tasty, and I have a lot of extra sauce for future summer roll dipping! *Note: Remember to leave some extra time for marinating the chicken when making this dish. 1. 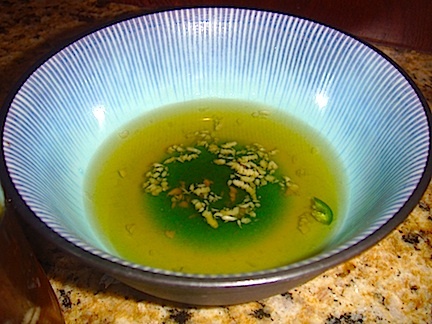 Place cut chicken pieces in a bowl with Nuoc Cham sauce and 1 T of Canola oil. Sprinkle with a dash of salt and pepper. Mix with hands. Cover and let sit in refrigerator for 2 hours (or 1/2 hour at room temperature if you prefer--that's what I did, but you should do what ever you feel comfortable with because warm meat is not something to mess with). 2. Heat 1 T. of canola oil in pan. Add chicken. Cook for 10 minutes until slightly brown. Spoon out extra liquid to increase browning (optional). 4. Add water chestnuts and cashews. Cook for 2 more minutes. 5. 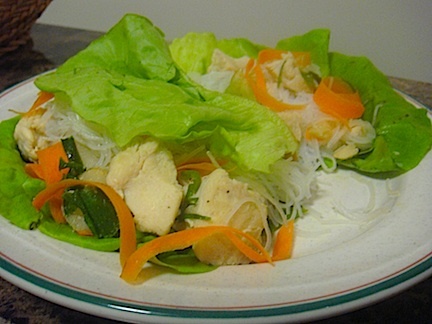 Assemble dish by adding chicken mixture and vermicelli to the lettuce cups and garnish with carrots. Spoon extra Nuoc Cham sauce on top of the finished lettuce wraps for extra flavor! 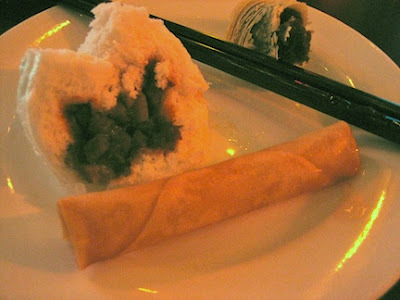 Recently when dining on dim sum at Red Egg near Little Italy, I used my first ever Restaurant.com gift certificate. Restaurant.com is a website offering discount dining gift certificates at a host of participating restaurants across the country. 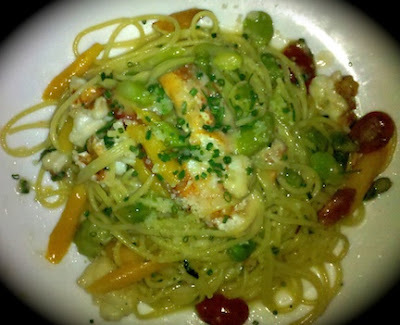 For example, when you purchase a $25 gift certificate you can receive $35 worth of food-- a 28% discount. Of course there are certain restrictions, so beware. 1. You can only use 1 gift certificate per party, per month, per restaurant, even if the party is seated at separate tables. 2. You CANNOT combine certificates. This really bummed me out! 3. Some restaurants do not let you use the gift certificates towards drinks. 4. Redeeming gift certificates may be restricted by day of the week or meal. 5. If you don't like surprises, read the fine print before booking. All of it! Once you get to know the rules, Restaurant.com does have potential for dining savings. Thanks to my gift certificate I went to a restaurant that I may not have tried otherwise, and I felt less guilty sampling even more dim sum dishes than usual! Some highlights of the Red Egg dim sum menu were the Red Egg Puff (really a mystery item- hard to describe, but worth trying) and the Roasted pork buns. 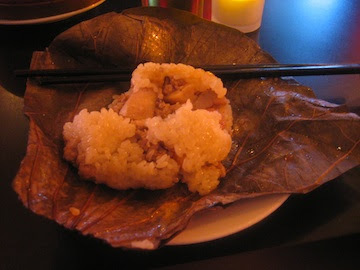 I also enjoyed the sticky rice in a lotus leaf and the meat skewers. One item from the regular menu that was a bit more money, but awesome, was the Peking Duck sliders. They make them right at your table which adds to the fun! HB Eats: Wined Up and Punched! If you are looking for a great meeting spot in the hectic Union Square area, I recommend heading North for a bit to the wine bar Wined Up, on Broadway between 20th and 21st. This hidden gem is located on the second floor above the restaurant Punch (follow the signs). The relaxing atmosphere and happy hour specials are key to this venue's attraction. 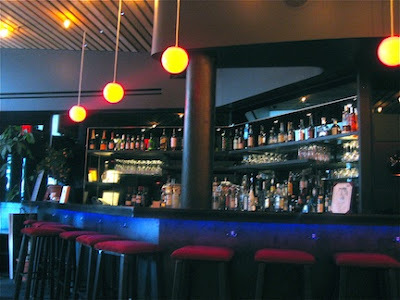 The bar also offers a selection of tapas which are similar to the menu offerings downstairs. Both areas have ample seating and a good vibe. As for the food, I only ordered food at Punch and the results were not very satisfying. 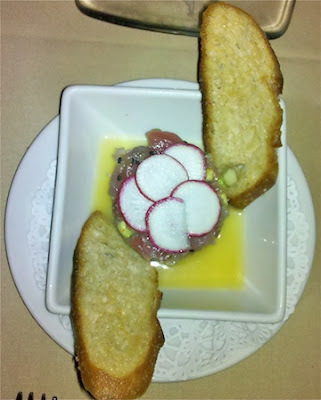 I enjoyed the tuna tartar appetizer, and the roasted Atlantic cod for my entree was cooked well, but my mashed potatoes tasted way too much like pure dijon mustard. One of my dining companions wasn't thrilled with his veggie burger either, but my other friend did enjoy the Maine lobster spaghettini. I guess with an ecletic menu like Punch's, dining can be a hit or miss. I had been to Punch once before and I remember the ravioli being very tasty, so perhaps pasta is safe bet. 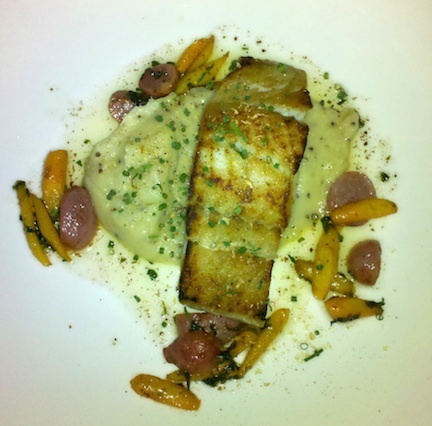 On the other hand, maybe after a few more drinks at Wined Up all of the food may taste great! 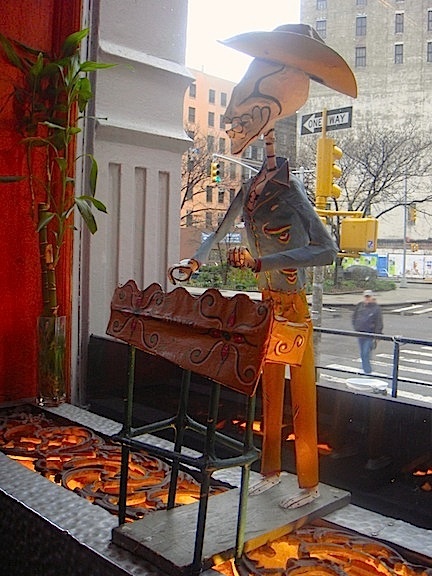 My recent trip to Centrico (update: Centrico is now unfortunately closed for business), Chef Aaron Sanchez's Mexican eatery in Lower Manhattan, was fantastic. The restaurant’s vast open dining area, high ceilings, and colorful décor give it a festive vibe and spacious feel. You can even check out all of the action in the kitchen as you grab a margarita at the bar. I picked a very early reservation that day because I had plans to see the show Sleep No More New York afterwards. SNMNY is a very cool interactive play based on Shakespeare’s Macbeth, and if you haven’t seen it yet it’s worth checking out! I decided to start my meal off with Tacos de Lengua- braised tongue tacos with tomatillo-avocado salsa. A few years ago the thought of tongue definitely would have freaked me out, but ever since I went to China and sampled a mix of unknown and exotic delicacies, I am slightly more adventurous in my everyday life. As a side note, the only food that I couldn’t bring myself to try in China was a sautéed honey bee! That still bothers me. :) Anyway, back to the meal...the tongue tacos were seasoned and cooked perfectly and went really well with the creamy salsa. The tongue actually reminded me of kielbasa (not chicken in case you were wondering). It was definitely one of the best tacos that I have had in New York, ever! For my entree I devoured a whole lotta pork, which was followed by another beauty: the Pastel de Chocolate Mexicano. If there are any other Food Network groupies out there, you may remember that Chef Aaron lost his Chopped All-Stars finale round because his molten chocolate cake, based on the same recipe used at Centrico, was dry. Well the cake that I received with my meal, which was served with choco-chile sauce and corn ice cream, was moist, light, and perfect. 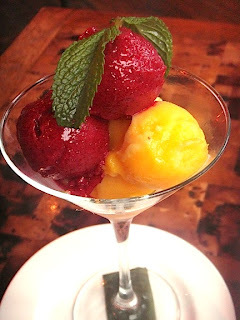 As a wonderful surprise, the kitchen also gave us a trio of fruit sorbet, on-the-house. 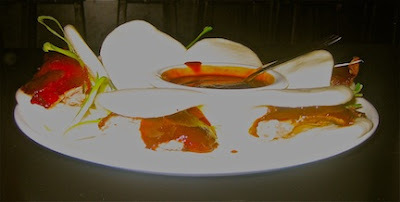 I definitely think Aaron deserves a rematch after tasting all of the great authentic Mexican cuisine at Centrico! HB Cooks: Slow Cookin' in the Summer! 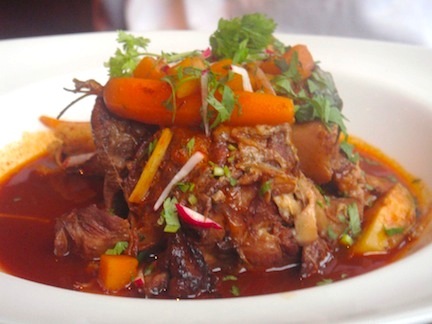 When I bought my first slow cooker in May I really thought it would be more of a winter appliance based on all of the hearty warm comfort food recipes I was finding in popular cookbooks. I soon realized the true summer potential however when the weather really started to warm up and I no longer wanted to turn my stove on every night. The slow cooker provides a great alternative because you can barely tell it's on (aside from the great food aromas coming from the kitchen of course)! So far I have made three dishes in my cooker: meatloaf which fell apart and was a little greasy for my taste, lamb stew which was good but slightly under-seasoned from the long cooking time, and my latest pulled pork sandwiches which were delicious! I used a recipe from The Gourmet Slow Cooker: Volume II, Regional Comfort-Food Classics . The prep for this recipe was super quick and easy! I just mixed the sauce ingredients in a bowl and poured the sauce over the roast in the cooker. That's it! 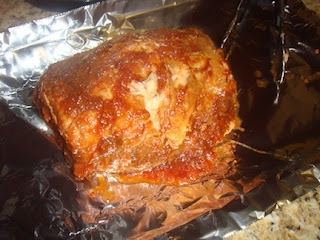 Then after cooking the pork for 8 1/2 hours on low heat, I removed the pork and placed it on a baking sheet with tin foil. The roast separated instantly as I pulled it apart with a fork and my hands. Meanwhile I skimmed some fat off of the sauce before returning the shredded pork to the cooker and serving on the buns. The recipe made 4 large sandwiches and 2 smaller ones. One minor snag that I encountered was that the kaiser buns which I used fell apart during the first round of sandwiches because of the shear amount of sauce. To avoid this problem during my second meal, I toasted the buns which helped a bit. Another simple alternative is to place the shredded pork from the baking sheet on the bun first and then spoon the sauce on top. 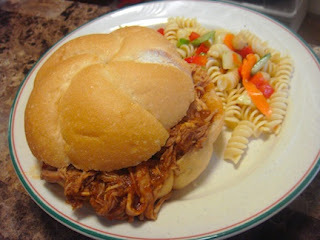 I served the pulled pork with a simple pasta salad, but any of your favorite BBQ sides would compliment this tasty dish!